Peter McDougall is Chief Medical Officer and Executive Director Medical Services and Clinical Governance at the Royal Children’s Hospital. Peter’s history with the Royal Children’s Hospital spans five decades, beginning in 1976 when he spent four years as a member of the junior medical staff. He returned for good in 1984, serving first as a Neonatal Physician, then Head of Neonatology and Chief of Medicine, before taking up his current role in 2010. 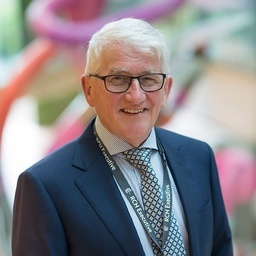 Peter was the inaugural chair of the Patient Safety Committee, which drove the formation of the MET team in 2000, and received the Royal Children’s Hospital Chairman’s Medal in 2009. He trained at The Royal Children’s Hospital and St Michael’s Hospital in Bristol, before commencing his career at The Royal North Shore Hospital, Sydney. Peter was recently presented with the HiMMS Elsevier (Healthcare Information and Management)CMO (Chief Medical Officer) of the year award for 2017. He has an MBA (Distinction) from the University of Hull (UK) and is a graduate of the Australian Institute of Company Directors. On a personal level, Peter has been walking along Elwood beach at 6am three days a week with three friends for 30 years, gets beaten up by his personal trainer, plays seriously bad golf and is a Hawthorn Football Club tragic.